Serpentine Design: Allows Magic Tracks to bend, flex, and curve in any direction. 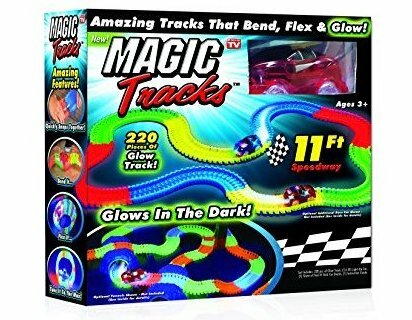 GLOW IN THE DARK: The track's neon colors shine super bright. LED Lights: Race car's 5 LED lights keep the track glowing as it keeps going. Pieces SNAP Together: Build a custom speedway in seconds. Track Rolls UP: For quick and easy storage.